Curved Sliding Doors Showcasing a Killer View. 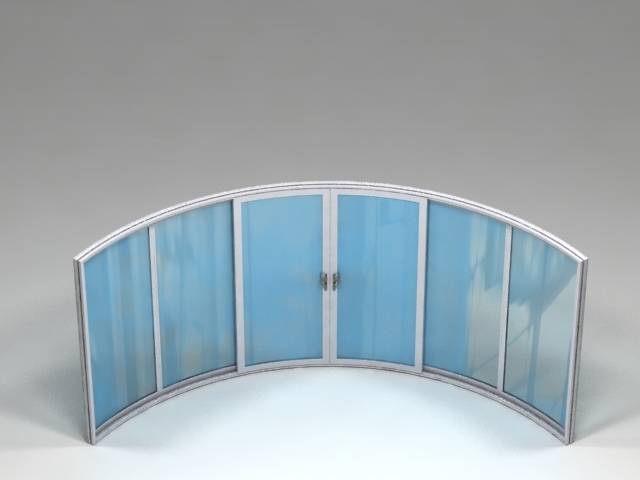 Curved sliding doors are all about the illusion of space. While not looking particularly remarkable in themselves, they make the outside look spectactular. If you have a great view, there is no better way to show it off than with curved sliding patio doors that wrap around a part of the room and seem to almost disappear while giving the feeling of being outside and immersed within that fabulous vista. Adding a curved sliding patio door to their Victorian home in Epping Forest has added impact, opened up views to the garden and created a highly-valued new living space for Nick Bowman and his partner Anne. 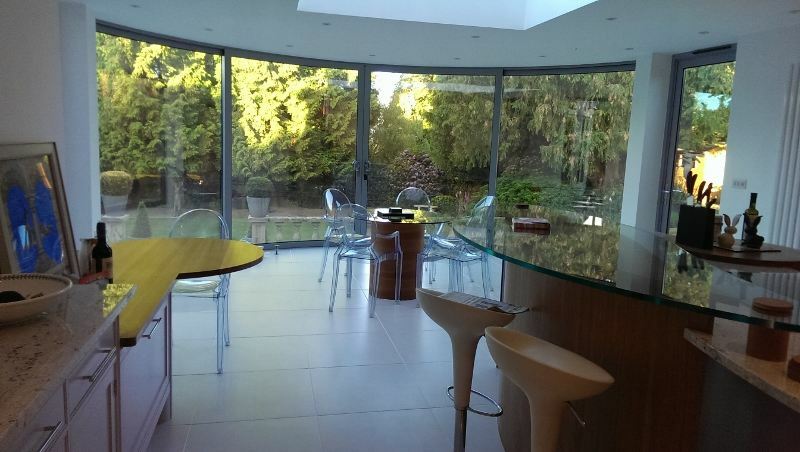 Fed up with a lack of natural light in their kitchen and a conservatory that suffered from temperature extremes, the couple decided to demolish the conservatory and back wall to build an extension incorporating a 7.19 metre-wide curved sliding door supplied and installed by Balconette. 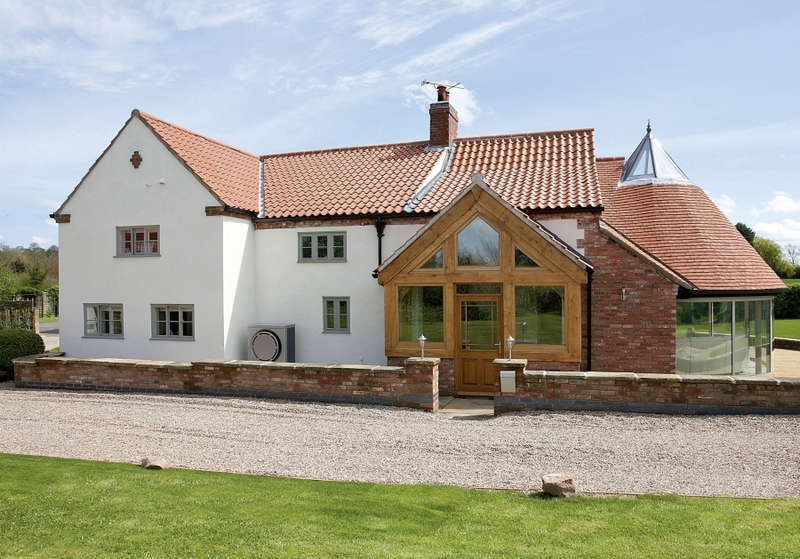 Balcony Systems delivers an inspiring set of doors to a 300 year old cottage in Nottinghamshire. One of Balcony’s largest curved glass patio doors installed in the UK made up of a combination of four movable (sliding) and four fixed doors, the doors make a truly impressive statement and demonstrate a spectacular appeal. Enclosing just over a semi circle (210 degrees) of curved glass and measuring ten metres in length the doors flood the living room extension with light from all sides. 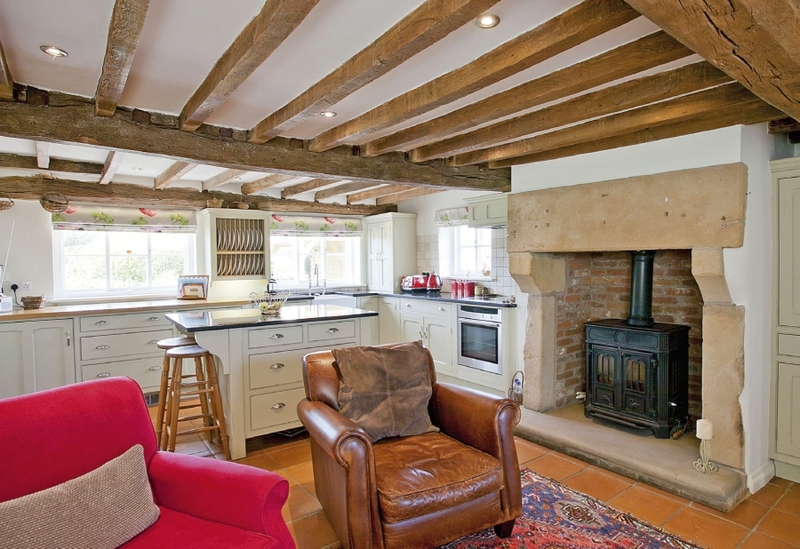 They were installed as a part of an extensive renovation to the 300-year-old property, which now comprises three former farmworkers’ cottages in one. The doors are finished with a RAL 7038 Agate Grey powder coating. 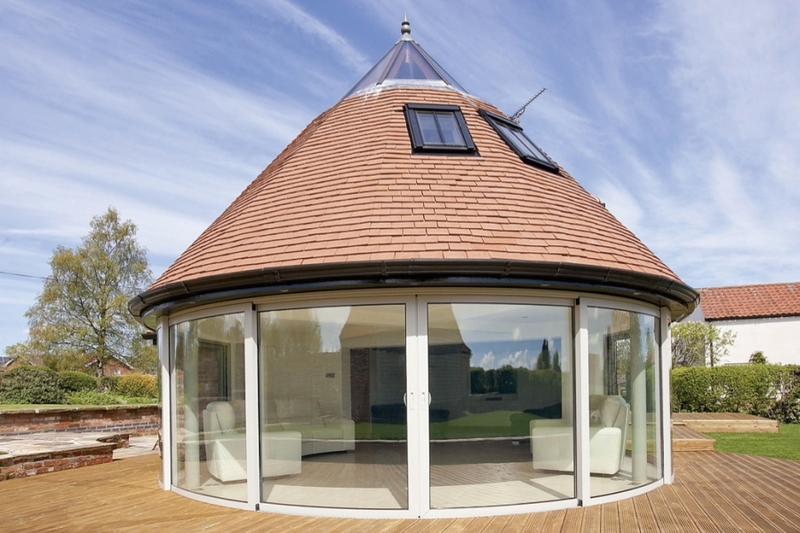 The circular shape was originally designed with wooden uprights, but the plans changed once the owners, David and Lynn Walton from Nottinghamshire, saw Balcony’s glass curved patio doors at the Grand Designs Live exhibition. 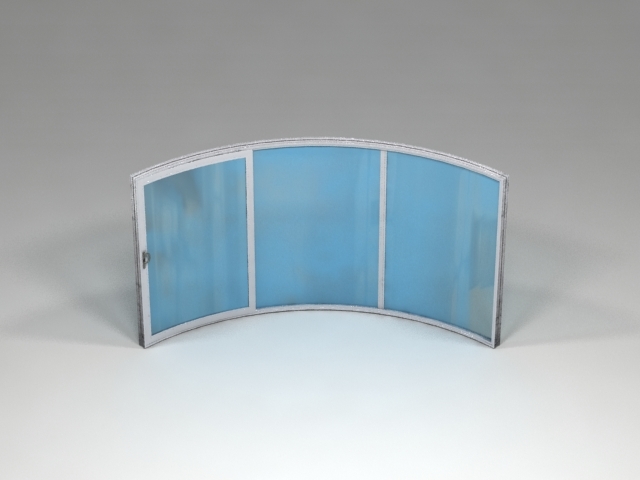 A great many options and combinations of fixed and sliding doors are available. 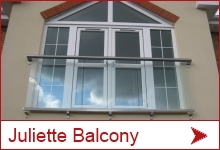 Balcony Systems offer an installation service as well as the option to buy and install yourself. An extraordinary project on the Isle of Man. 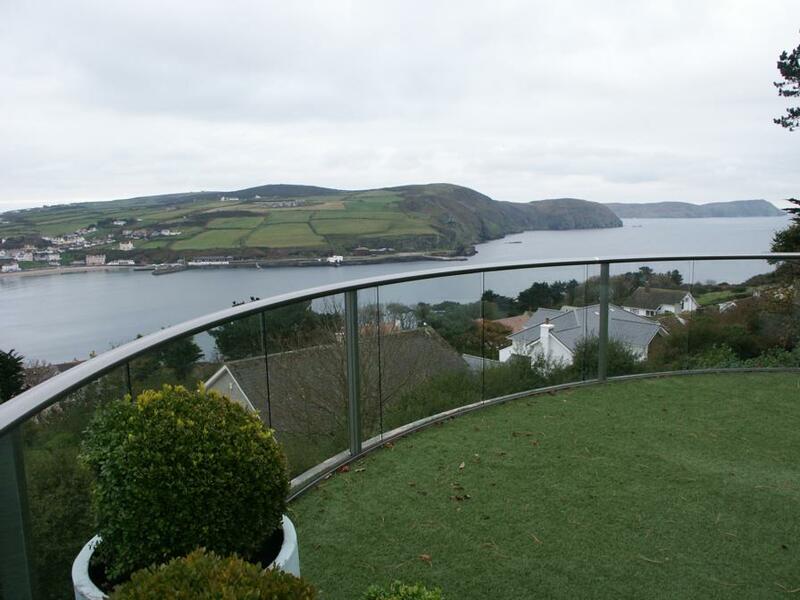 Fantastic panoramic views of the southern tip of the Isle of Man from a luxurious bed and breakfast property are fully exploited using every product from UK balustrading specialist Balcony Systems’ wide range of low-maintenance clear glass balustrading and curved sliding patio doors. 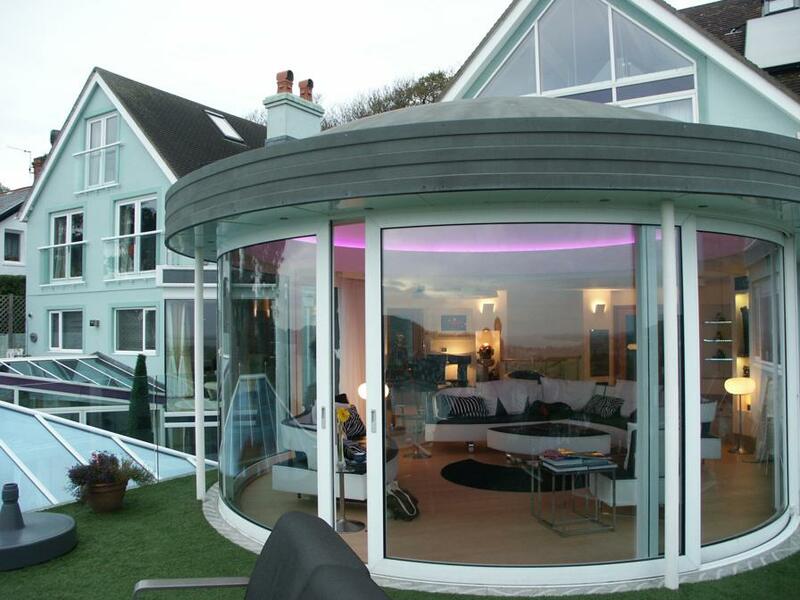 Owners Philip and Jillian Routledge specified Balcony’s four-panel curved patio door, with two sliding panels, that forms the stunning centrepiece of the domed guest lounge at The Arches overlooking Port Erin. 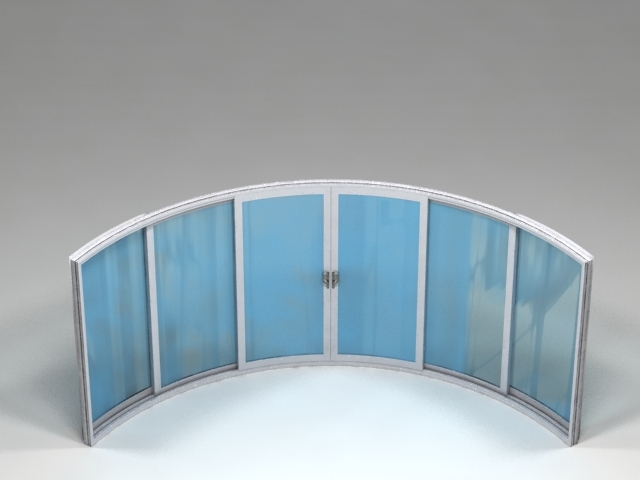 Either side of the curved white aluminium powder-coated doors are two further straight patio doors allowing additional access to the outside space. Measuring 5.2 metres across and maximising the 180-degree views, the curved door has double glazed units with Low E glass and a 16mm air space that achieve a 1.8W/m2K U-value. It opens onto a square terrace with a structural glazed balustrade, also supplied by Balcony Systems. This balustrading style was chosen specifically to fulfil safety requirements with low-maintenance minimum visual impact, plus the added benefit of protection from prevailing winds. The curved patio doors and balustrading elements were installed by Chris Wedgwood, Managing Director of Jurby-based Hamilton Project Management Ltd and incorporated as part of extensive remodelling to the substantial 1920s building, perched on a steep site in Tower Road. Five years of construction work included rebuilding and extending the southern elevation and roofing over what was an outdoor swimming pool. Following the shape of a second lower terrace next to the swimming pool are nearly 40 metres of Balcony’s curved and straight balustrading, topped with an anodised silver handrail. Above this terrace, three glass Juliet balconies supplied by Balcony Systems maintain clear views from guest rooms on two upper floors. Having holidayed on the Isle of Man for many years, the couple moved there from the UK in 2006 having fallen in love with The Arches’ spectacular coastal location. The B&B opened for business in 2011. Philip, from Liverpool, explained: “The incredible views inspired all the glass as the whole point was to maximise the pleasure from them. 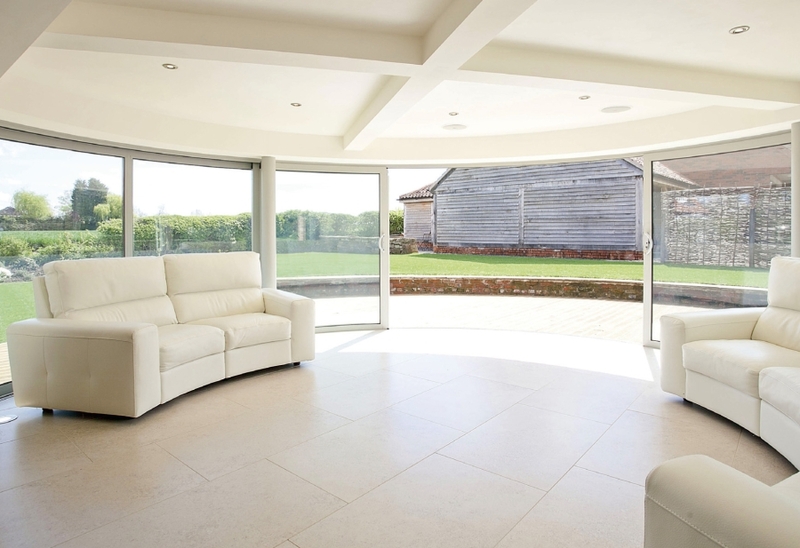 It’s unusual to have 180 degrees of such splendour – and the curved patio door from Balcony Systems really does it justice. Everyone is stunned when they see it and it adds so much to the value and enjoyment of the property. Top quality products that are built to last. “As the house is located near to the sea, that’s great for the views but a real challenge to the materials used to enable us to enjoy them to the full. After four or five years of installation, the finishes on our Balcony products are like new. Project architect John Cryer, of Marshall Cryer Architects said an initial triangular design for the lounge was adapted into a more space-efficient curve after consultation with Balcony Systems. Stunning views from Balcony Systems’ curved sliding patio doors at Gara Rock resort. 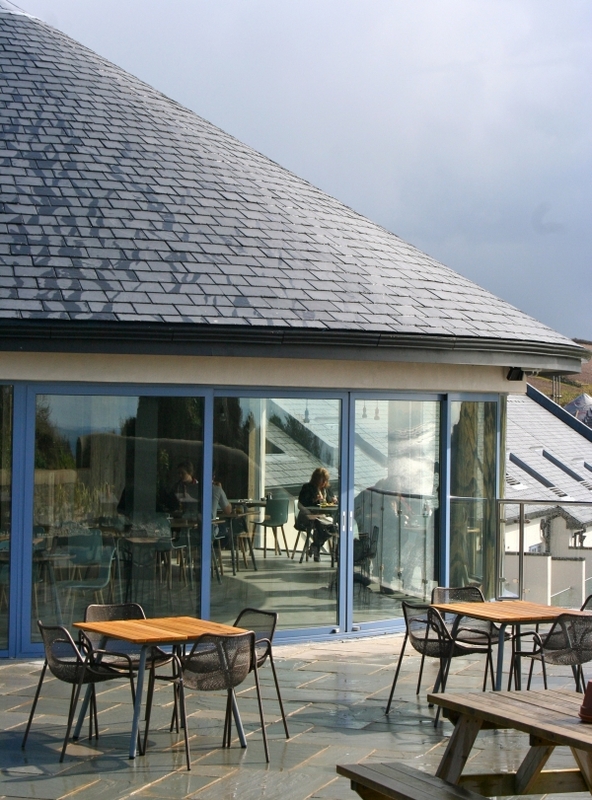 Panoramic ocean views are dished up every day for diners at this new South Devon restaurant – thanks to a show-stopping curved sliding patio door from Balcony Systems. 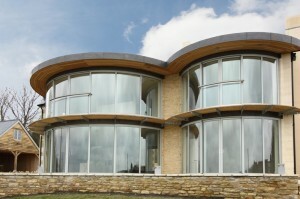 The balustrading and curved door specialist met the architect’s specification with a nine-panel door, incorporating two sliding panels, spanning well over half the building’s circular sea-facing elevation. Measuring nearly 15 metres in width with a blue powder-coated finish, the door opens onto an outdoor dining terrace at the Gara Rock Restaurant, part of an exclusive coastal resort complex built by Coast Group near Salcombe. 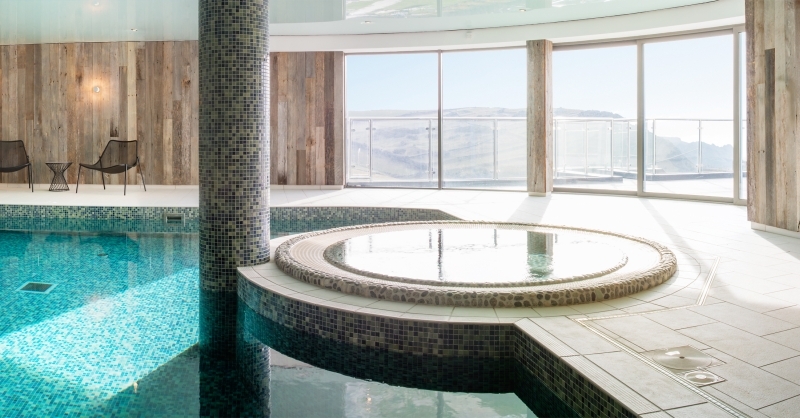 Directly below, a second eight metre-wide curved patio door with two sliding panels, also supplied by Balcony, offers similar spectacular sea views for guests using the indoor swimming pool and spa facilities. Suitable for virtually any commercial or residential property, Balcony’s curved patio doors add the ‘wow’ factor with a versatility that allows for a variety of sliding or fixed configurations within almost limitless creative scope for designers and architects. Wide openings can be achieved to seamlessly connect interior and outdoor spaces. Adding extra fixed curved panels allows for longer glazed runs, further enhancing views, light and the feeling of space to any interior. Simon Baldwin, Director of Aminghurst Ltd, Gara Rock’s owners, commented: “Both doors are quite stunning, creating a distinctive visual statement and making the most of impressive vistas from the building. The beautiful Greek island of Paxos is home to Chris James. The island is lush and green with a very Italian feel. When Chris decided to re-build an old windmill which stood in the grounds of his villa he wanted to keep its traditional look and feel. The windmill, which will be used as a guest cottage, has one bedroom and bathroom on the ground floor and a living room on the first floor to make the most of the sea views. The windmill is creating a lot of interest locally so Chris knew he had to get everything right. He found Balcony Systems Ltd on the internet and was immediately won over by their stunning curved glass patio doors and placed an order. 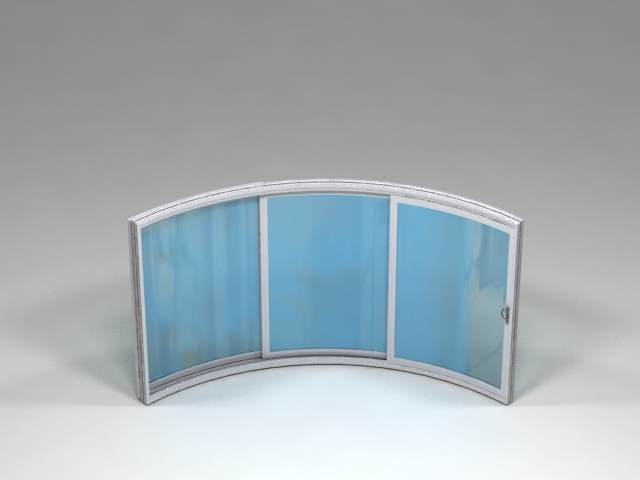 The three-panel curved patio door measuring 4.5 metres wide will be installed in the first floor living room so guests can enjoy the spectacular sea view . 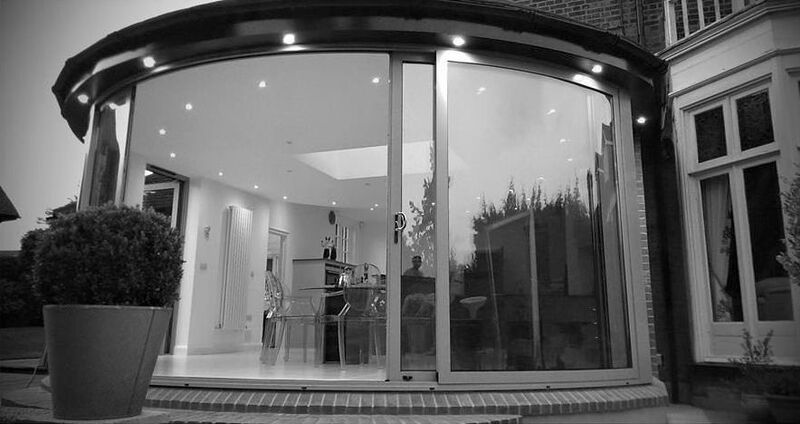 Balcony Systems’ curved patio doors are part of an award winning project. 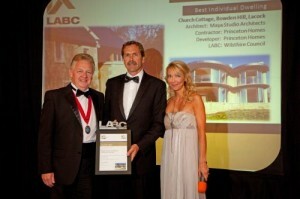 A recent timber frame construction completed by property developer Princeton Homes has won Best Individual Dwelling in the West of England Local Authority Building Control (LABC) Excellence Awards. The award ceremony took place in Bristol at the Royal Marriott Hotel on 9th July. The judges were impressed by the high standard of design, construction and workmanship of the build, which is based in Lacock, Wiltshire. Innovation has always been the back bone of this industry. At times of great stress when the economy takes a turn for the worse or new regulations force significant changes, companies have innovated, both commercially and technically, to come up with new solutions that attract new customers and new possibilities that extend the market. Right now, system companies, hardware and component companies and fabricators have been active in improving and developing their product range to help their customers maintain their competitive edge. Homeowners have a much wider choice of window styles and colours, a choice of energy efficient windows and a wider choice in doors. 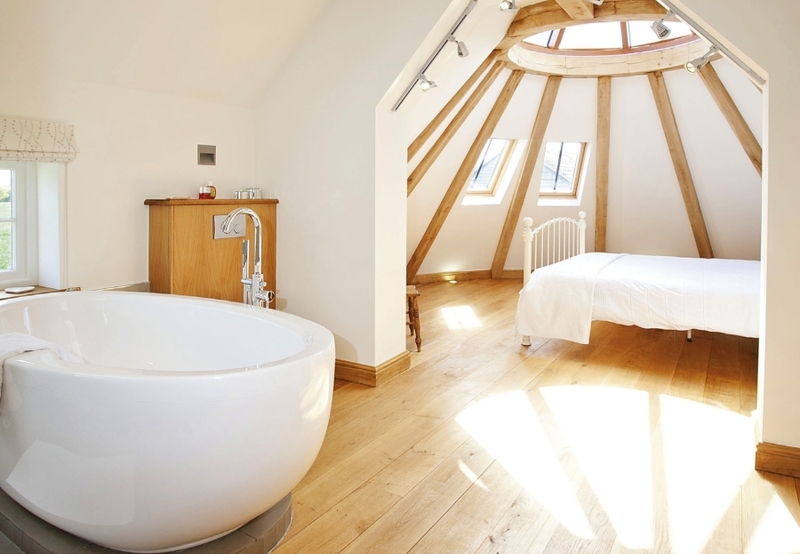 TV programmes such as Grand Designs have also encouraged homeowners to be more creative and adventurous. They encouraged people to look at the possibilities in properties, and to look for products that add value, style and uniqueness. These programmes and their counterparts in printed media have opened homeowners’ eyes and imagination. They’ve given homeowners the confidence to look for products that can make their property stand out from the rest, and for products that are able to transform a building. They are more confident about experimenting with the shape, size and look of their property. Suppliers and installers – enablers – that can help homeowners achieve their vision and transform their properties will be the winners. Since the start of the year we have been pedalling fast to keep up with the demand for our balconies, balustrades and curved patio doors. The upsurge in demand in the midst of a deep recession may surprise some, but architects, developers, self builders and homeowners want to make properties look different, better and more stylish, and when offered the means to do so are quick to find a way to do it. A stylish balustrade, or stunning curved patio doors really do transform a building and you don’t need to be an architect to see their potential. Many window and door companies are discovering they have the skills and experience that can help them take advantage of this opportunity. A number have already been selected to become Balcony dealers and distributors and are helping transform their customers’ properties and their own prospects. Effi Wolff, Managing Director of Balcony Systems Ltd, outlines the challenge of installing high-tech curved glass doors into a home within the constraints of Conservation Area planning. 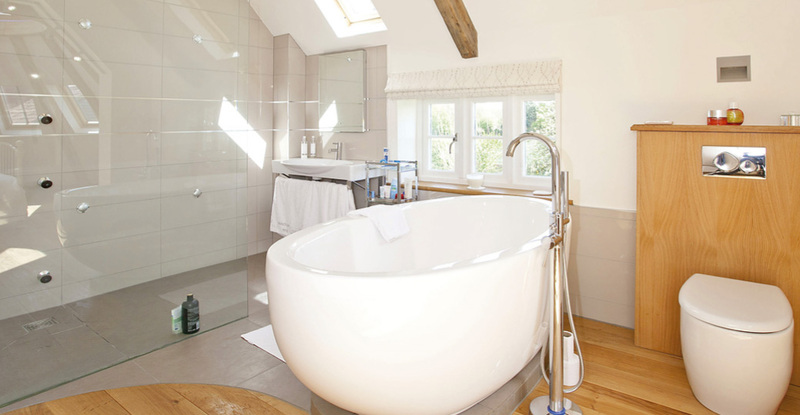 The brief for housebuilder Princeton Homes was to build a high–spec timber-framed stone finish detached home using the latest eco-friendly technology and materials. The property, which is located in a conservation area, overlooks National Trust land in the picture-postcard village of Lacock, Wiltshire. Situated on top of a hill, it is visible for miles. The build had to be acceptable to planners while making the most of spectacular views and delivering the ‘wow’ factor to the client. The solution: to build a traditional stone cottage with natural slate roof at the front and large futuristic curved glass bays at the rear, to take advantage of the 180° views over the Wiltshire countryside. Andrew Turner, Managing Director of Princeton Homes, turned initially to the internet and put his requirements to eight companies. Balcony Systems Ltd was the only company to respond, presumably because of the complexity of Andrew’s design. I was confident that working together we could master the challenge. Once planning permission was granted for the concept design we sat down together to work out the exact specification. The design called for curved glass doors in the living room/kitchen and snug, with matching doors and Juliette balconies above in the master and second bedrooms. We agreed on two curved 10 metre and two curved 5.8 metre VisioGlide 100 glass doors, with two Juliette balconies for the bedrooms, all using our own Royal Chrome anodised aluminium handrails. The doors are 28mm double-glazed toughened Low-E glass, with a high weather rating (essential in this exposed location), and energy efficient in keeping with the eco-friendly ethos of the project. 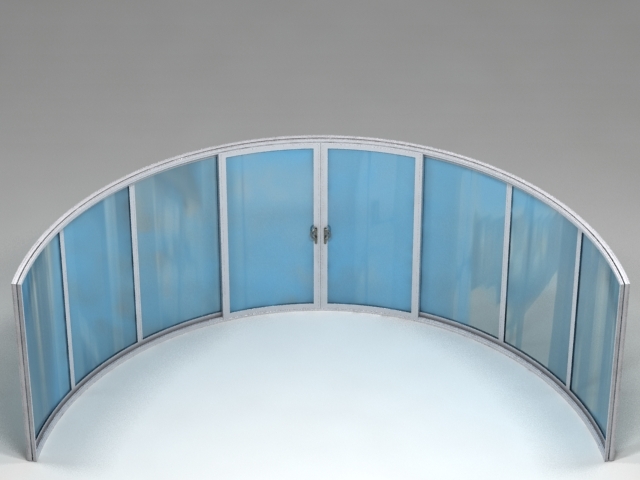 The living room/kitchen door has six curved panels, four sliding and two fixed, while each of the others has two sliding and two fixed curved panels. The master bedroom has a 2.74m curved Juliette balcony and the second bedroom a 2.00m Juliette, so the doors can be opened safely. Balcony’s system means there are no vertical posts or intrusive clamps in the Juliette balconies, leaving a clear expanse of glass from handrail to floor so there is nothing to interrupt the view. Although they are unobtrusive they have a permitted load factor of 0.74 kN/m uniformly distributed on the handrail and use 10mm clear toughened glass. This project represented a leap of faith for everyone – Andrew hadn’t built anything like this design before and this certainly wasn’t an everyday design for Balcony either. A standard feature of Balcony products is their ease of installation – many homeowners have successfully ‘done it themselves’ – but this project was not so straightforward. One of the main challenges was to fit the curved bays into the square slate roof. Our sister company VBS Ltd, installation specialists, working closely with the timber frame company and the roofers, had the necessary steelwork cut and fitted into the wooden frame. The roofers brought together the curves of the glass doors with the square traditional slate roof and the result is stunning. The result: the curved glass doors allow uninterrupted panoramic views from the house for miles ahead. Curved Juliette balconies fitted on the first floor mean that the glass doors in the bedrooms can be opened and the views enjoyed in safety. The minimal hand rail, with glass reaching from top to bottom and no clamps between panes mean there is nothing to distract the eye. The overall effect is one of light and space and integration into the landscape. Careful planning and co-operation between the contractors and Balcony meant the project came in within budget and on schedule. The property is valued at around £1.5 million. Forget ordinary, homeowners want amazing. An increased interest in good, innovative home design is a considerable factor in today’s market. 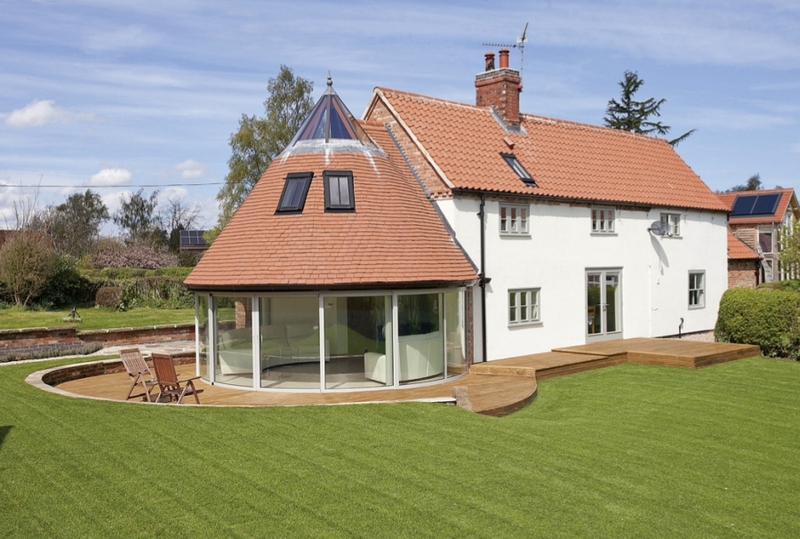 Television programmes such as Grand Designs have encouraged homeowners to be more creative and adventurous when planning new build or renovation projects and this trend offers a major opportunity to architects, developers, suppliers and installers. Homeowners look for products that make their property stand out from the rest and transform a building from ordinary to amazing. They are more confident about experimenting with the shape, size and look of their property. Those who can help homeowners achieve their vision are in the best position to benefit from this new found enthusiasm. 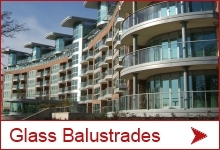 As a leading supplier of glass balustrades, curved patio doors and Juliette balconies, we are making the most of this desire for innovation and style, and experiencing rapid growth as a result. The contemporary design of our products and the maximum use of glass with minimum interruption make ita perfect choice for new build and refurbishment projects. Our balustrades and Juliette balconies have no ugly clamps or corner posts and fewer uprights than comparable products to give unobstructed views. 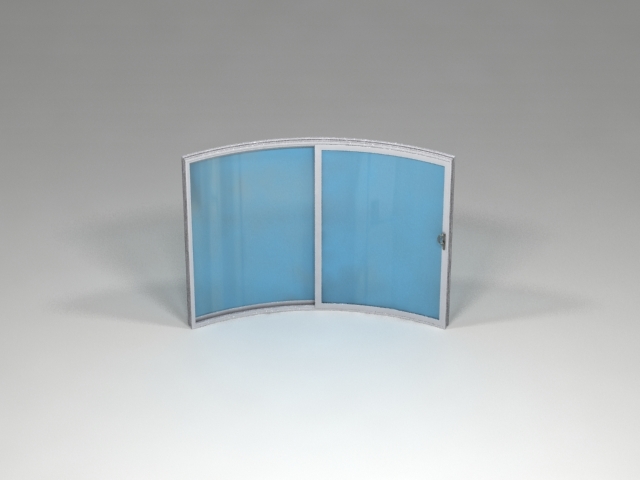 The handrail stops the glass from flexing, making installations safe, and because it’s made from anodised aluminium the risk of rust in marine environments is avoided. Recently we added self-cleaning glass coating across our complete range, which uniquely is applied to both sides of the glass. The coating reduces maintenance of the glass, so it looks new for longer, and doesn’t require any special cleaning substances which makes it environmentally friendly. It can also be applied to tinted glass. Adding to the great looks and stylish design of our products is the ease of installation. Most window and doors installers already have the necessary skills so why settle for ordinary when the customer is looking for outstanding? Many homeowners now look to the internet to see what’s available – if they have seen innovative designs on television they will try to find similar ideas for their own property. 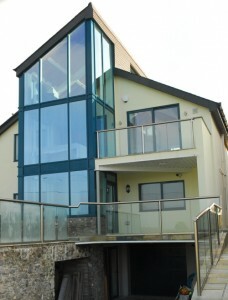 Widening your range to include glass balconies for example, allows suppliers and installers to tap into this interest. Another customer to appreciate this is Mike Murray, whose project was front cover plus six pages in the September issue of Self Build & Design magazine. 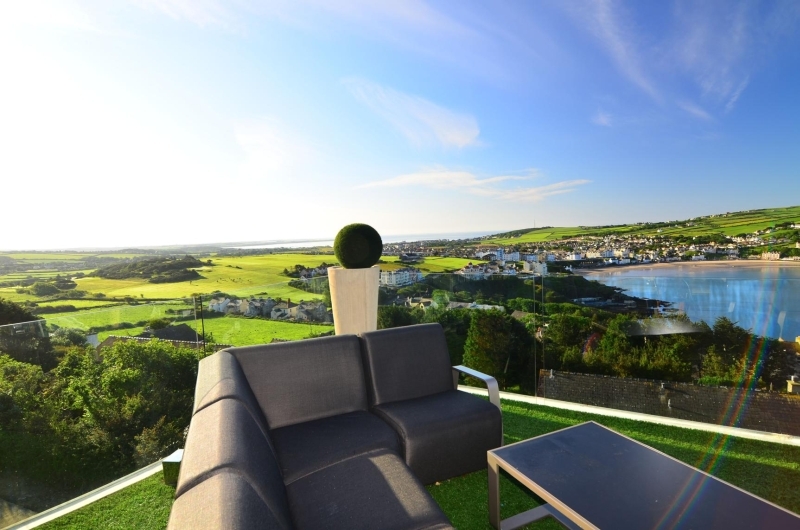 When it came to choosing the balustrade for his house in South Wales he knew exactly what he wanted – a balustrade which didn’t interrupt the spectacular view of the coast from the glass-walled sitting room. The uncluttered finish of Balcony’s balustrade matched the modern exterior of his home and the twenty eight metre balcony complements the look of the house and adds value. For stunning use of glass it is hard to beat our curved patio doors, which require the use of precision bent curved glass. This is an art in itself. 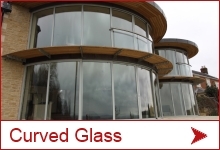 All curved doors are supplied with 28mm double curved glazing using Low E glass as standard – and of course the self-cleaning coating is available too. The perfect illustration of what our curved patio doors achieve for buildings is shown in a recent project near the historic town of Lacock. A new build on the site of an old cottage, the house is in a National Trust conservation area so the design had to be exceptional to gain planning permission. Permission was granted to build a traditional stone front and to the rear an ultra-modern expanse of Balcony’s curved glass doors with two Juliette balconies for the bedrooms. The doors form a key feature of the build and the project recently won an award for Best Individual Dwelling in the West of England Local Authority Building Control (LABC) Excellence Awards for the high standard of design, construction and workmanship. Projects like this prove that your potential customers are looking for more than run-of-the mill products. They want the ‘wow’ factor. Balcony Systems makes it easy to provide it.